Shouldn't Nikki Haley be more concerned about that Islamic crescent moon in the logo?! In an op-ed piece for The Wall Street Journal, South Carolina Governor Nikki Haley railed against President Obama and the National Labor Relations Board (NLRB), or more specifically, Obama's "silence" on the move from the federal agency in charge of investigating and remedying unfair labor practices. The issue at hand involves a NLRB complaint alleging that Boeing wants to build its new 787 Dreamliner in North Charleston, S.C., instead of at its Puget Sound facility in Washington state in retaliation against the International Association of Machinists for strikes such as a two-month-long work stoppage in 2008 - something that appears to be a violation of the National Labor Relations Act (NLRA). 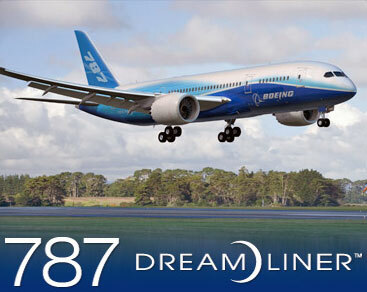 In October 2009, Boeing, long one of the best corporations in America, made an announcement that changed the economic outlook of South Carolina forever: The company's second line of 787 Dreamliners would be produced in North Charleston. In choosing to manufacture in my state, Boeing was exercising its right as a free enterprise in a free nation to conduct business wherever it believed would best serve both the bottom line and the employees of its company. This is not a novel or complicated idea. It's called capitalism. Boeing has since poured billions of dollars into a new, state-of-the art facility in South Carolina's picturesque Low Country along the Atlantic coast. It has created thousands of good jobs and joined the long tradition of distinguished and employee-friendly corporations that have found a home, and a partner, in the Palmetto State. This a win-win for South Carolina, for Boeing, and for the global clients who will see Dreamliners rolling off the North Charleston line at the rate of 10 a month, starting with the first one next year. But, as is often the case, a win for people and businesses is a loss for the labor unions, which rely on coercion, bullying and undue political influence to stay afloat. South Carolina is a right-to-work state, and we're proud that within our borders workers cannot be required to join a labor union as a condition of employment. We don't need unions playing middlemen between our companies and our employees. We don't want them forcefully inserted into our promising business climate. And we will not stand for them intimidating South Carolinians. That is apparently too much for President Obama and his union-beholden appointees at the National Labor Relations Board, who have asked the courts to intervene and force Boeing to stop production in South Carolina. The NLRB wants Boeing to produce the planes only in Washington state, where its workers must belong to the International Association of Machinists and Aerospace Workers. First, I want to address one of the arguments made by Haley, as well as other NLRB critics. "I want to ask (President Obama) why he is allowing unelected bureaucrats to come in and do the unions' dirty work on the backs of our businesses," Haley had told National Review Online. Haley calls the board members "unelected bureacrats." The "unelected bureaucrats" are appointed by the president and elected by Senate confirmation hearings. The NLRB chairman, Wilma B. Liebman, was appointed by not only President Bill Clinton, but by Republican President George W. Bush, too, and eventually reappointed by Obama. Board members Brian Hayes and Mark G. Pearce were confirmed by the Senate, leaving only Craig Becker as the only appointee of Obama not to be confirmed - there is currently one vacancy. The other argument is that the NLRB's move is political, and Obama is staying quiet to appease labor, which was a big supporter for the Democrats in the 2008 elections and as we have seen after the turmoil in Wisconsin, a target for Republicans. Kenneth Yerkes, who chairs Barnes & Thornburg's labor and employment department, claims the president is using the agency because of roadblocks in Congress. The complaint against Boeing "may be the biggest legal stretch so far," says Kenneth Yerkes, who chairs Barnes & Thornburg's labor and employment department. He says the Obama administration has failed to achieve its legislative agenda in Congress and is trying to make an end run around lawmakers. "He is now saying to organized labor, 'We'll get this done administratively,'" says Yerkes. Labor offered a lot of support to Obama in 2008, and he'll need that support again, says Yerkes. "So this is as much a political issue as a legal one-if it is legal at all," he says. Yerkes says that unions are trying to come up with every idea they can to make it difficult for companies to make business decisions that disadvantage unions and their ability to organize and sustain a dues-paying base. "Unions are fighting vigorously to maintain their rights in the public sector because that's where their most significant growth has been and is going to be," says Yerkes. And in the private sector, he says unions are trying to use agencies to change the way existing laws are interpreted and applied. "This is an affirmative effort by the administration to create advantages for labor to hang onto its dues-paying base and expand that base," he says. Critics also believe the move by the NLRB, and by proxy President Obama, is anti-competitive and anti-capitalist. Haley wrote that "Boeing was exercising its right as a free enterprise in a free nation to conduct business wherever it believed would best serve both the bottom line and the employees of its company," which she called "capitalism," but she essentially ignores the possibility of any anti-labor activities taken by Boeing. Investor's Business Daily similarly wrote in an editorial chastising the agency. Boeing's move is not about retaliation. It's about remaining competitive in an increasingly competitive global market against Europe's Airbus and even possible Chinese competition down the road. Unable to get a no-strike pledge out of the IAM at Puget Sound, the "overriding factor," said Jim Albaugh, CEO of Boeing Commercial Airplanes, "was that we can't afford to have a work stoppage every three years." They also thought the move by the NLRB was coincidently close to Obama's re-election bid announcement and the events that have transpired in Wisconsin. If you ask me, it sounds as if Boeing's decision was in retaliation to the unions. "We can't afford to have a work stoppage every three years" said Boeing's CEO - it is strange since the last strike for the company was much more then three years, and not to mention, the 2008 strike had to deal alot with what IBD claimed Boeing was trying to avoid. Boeing had outsourced much of the construction of the 787 Dreamliner, with the wings built by Mitsubishi Corp. in Japan, its doors by Latecoere in France, and the fuselage sections manufactured by a joint venture with Italian Global Aeronautica in South Carolina (Boeing had since taken complete ownership of their Charleston operations). Basically, this is not an issue of competitiveness but yet another assault on unions, which is why critics like Haley are coming out to vocalize support for Boeing. Should Boeing win, it would be a win for conservatives who have been working tirelessly to dismantle unions across America. Haley makes the argument that Boeing building the Dreamliner in South Carloina would be a "win-win" but Washington and South Carolina's unemployment and income disparity rates are comparable - Washington (ranked 33rd) experiences 9.2 percent unemployment to South Carolina's (ranked 42nd) 9.9 percent, and regarding income disparity, Washington has the 15th highest disparity to South Carolina's 29th, but even then, the top 5 percent and bottom 20 percent of families in Washington make more than those in South Carolina, so really, Nikki Haley can't talk about competitiveness when the competing state has similar or better labor statistics, and if you want to count stock performance, since the NLRB's complaint was filed in March of 2010, shares of Boeing had risen from $67.93 to $78.55 - roughly a 16% increase in one year, which is better then what those socialist government bonds are returning!